Carthage Lake:It was in the early morning hours of Tuesday, June 17, 2008, sometime around 4 a.m., when Jeff Bigger franticly came wheeling into the pumping house station from his turn on patrol of Henderson County's District #2's most concerned hot-spot. Wednesday through Monday, everyone made a fervent effort to save the levee that secured the Henderson County bottoms and the pumping station which drainage ditches flow into before they are pumped over the levee and into the Mississippi River. Everyone had felt good about the job so many volunteers had done and they were pretty confident, even with waters coming in higher than the flood of '63, that the levee would hold. 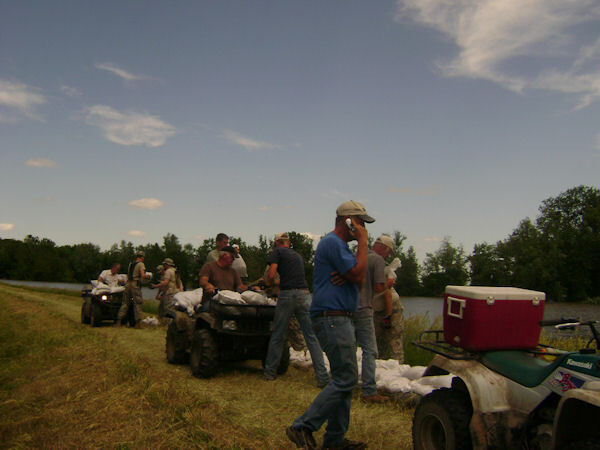 Work had finished up about 7 p.m. with everyone exhausted from their constant effort of filling and lifting heavy sandbags, running the levees, getting muscle cramps and sunburns, while at the same time moving personal items of their own, out of danger if time allowed. The river was moving much too fast, and there just wasn't enough time to do everything and secure the levee. Everyone was concentrating on not letting it breach. At 7 p.m., levee work was finished, volunteers were gone, except a crew remained to watch and do the night maintenance. Besides Mark there was his brother Mike Ford, and Fay Russell, Gail Russell, Larry Russell, Ned Adams, Calvin Covert, Johnny Galbraith, Jeff Bigger, Tim Bewley, and Larry Gapin who runs the pumps. "If they see problem spots- they would sandbag it," Mark said. "So, we went out on patrol at 11 p.m. and we had some low spots that we raised up and put more sandbags on, and we returned about 2:30 a.m. While some tried to rest, Jeff Bigger was on patrol with his 4-wheeler and sometime around 4:30 a.m., "He heard the roar of the water and he didn't actually get up to the break, but he knew by the sound something big had happened." "He raced back to the pump house and warned the bunch of us that something had broken about three quarters of a mile south, and everyone scrambled to get their trucks and headed out." The groups immediate concern was Nancy Gapin who took off down the Carthage Lake road with her big 4 wheel-drive dually truck. "She was weaving back and forth through the strong current and had Larry's cell phone on the seat of the car. He was frantic but couldn't call her, but Mike (Ford) was able to call Nancy on his phone. "She was crying, but said she had made it okay. "The guy behind me, didn't make it!'" she exclaimed. It was Johnny Galbraith who had followed her out in his smaller truck. "It was too dark to see well," Mark continued. "But someone on the levee saw him on top of his truck, and that he didn't make it, so we knew we couldn't get out that way. "We parked our vehicles upon the levee behind the pump house - our safe haven - after calling for emergency help for Johnny. Our vehicles are still sitting there until the water is down," Mark continued. "We were calling 911 to get help for Johnny first, because his life was at hand. "I called my wife and told her to call our son Charlie, to have him call people still in their homes. A Helicopter got Bill Gesling, and Mike Whitemore got out when he saw water going under his trailer. He hadn't needed the wake-up call." Mark gave his wife Olive, names of all who were down there, and he let her know they were safe, and they would call Marty (Lafary). He would get them out. "Marty (head of flood operations) has been great through all of this," Mark said. "Kathy and Jim Browlee were in their home at Carthage Lake after they had been helping earlier, and they joined us on the levee. Mark said everyone called their families to let them know that the levee broke and they were okay. As commissioner, he had to call the Corp of Engineers as well, so they could notify other people. After all the calls were made, Mark then thought about how he was going to get out of there. "My 4-wheeler was in water up to the handlebars by the time I thought of it. Gail Russell decided to take a 4-wheeler to the north to the railroad and see if it was safe to get out that way. He had made it to Highway 34 and to the Great River Bridge and called us to let us know it was safe to come through that way. Fay Russell took his 4-wheeler out and took a couple of us at a time. The rest of us walked, and wherever we were when he came back is where he picked us up." Mark said that Gail went on to his mom's farm to check a few things and move some items to higher ground and most went there and helped. Ned Adams called his parents and they came in a pickup and hauled the rest to the Ayerco Station which had been closed. The gas pumps were all gone and had been shut down a day or two before. Marty arrived and picked up everyone in his red Twomey Co. truck. "It was probably an hour before 5 miles of HWY 34 was covered," he said. Mark said, "We helped move some of Russells things upon the Bluff at Sam Stevenson's place. "We were all called to the "Command Center" in Gladstone and they wanted to know who was all in there and who didn't get out, and who we needed to rescue. They wanted to make sure everyone was evacuated and all accounted for and to double check the situation." Mark recalled how the water came in fast. "It only took about 12 hours to completely fill District #2 and it went over the top of the BNSF tracks that run from Burlington, Iowa to Gladstone. When that went down around 5 p.m. Tuesday evening, Russell Torrance was sitting on his front porch situated near Gladstone at the west edge of Twomeys' buildings, watching it cover up the District giving him a nice river front view, at present. It had taken two hours for the waters to get to the Torrance farm. "After the briefing and everyone was accounted for, Senator John Sullivan arrived for moral support and to let them know that the state was going to do all that they can." "The Unified Command - Homeland Security - were there to take care of all of the Henderson County flooding, from Dallas City, Lomax, Carman, Shokokon, Carthage Lake, Gulfport, Lock & Dam 18, Gladstone and Oquawka. Mark said that no one along the river of Henderson County is " getting out of this one without wet feet." It is estimated at least 28,000 acres were under water in Henderson County due to the flooding of 2008. Mark, Commissioner for Drainage District #2, said "I've been on the Commissioner Board from 1988 to 1999 and went thru the '93 flood and got off and they just talked me into taking somebody's place. I think I'm a bad omen." But Ford couldn't have been more perfect for the job. He took care of people first and then remembered his 4-wheeler was up to handlebars in water by the pump-house shed. He was able to move his big machinery from his farm and grain from the bins, but there was no time to return for smaller tools. Most farms and homes are under water of his neighbors and friends in the bottoms, and it is very hard to see this happen. For Mark, as a commissioner, he says, "Now we are waiting:waiting for the river to recede. With a big hole in the levee, we have to wait until it gets down. There is at least 1/4 mile of the levee that is gone. From the top of the water to the bottom, I'd say it is about 37 feet deep. You can imagine how it just keeps digging a bigger area out." Ford says they will need to wait until the river is below 15 feet at Burlington. "Our pumps still work at the pumping station, but if we pump water out now, it will just come right back in." The pumping station receives some of the water from other districts by gravity from the north, and they pump the rest to the station and over the levee out into the Mississippi. There is a lot of work. They must flatten the levees back to the required height required by the Corp of Engineer. Illinois can not have their levee higher than Iowa or vice-versa to give one side an unfair advantage which could force the other side to flood. Other problem caused by the flooding is the loss of railroad tracks between Burlington, IA and Gladstone. They say, "50 trains a day were using this railroad track and it is a big inconvenience: one of their main lines will have to be fixed as soon as possible. There are a lot of things affected, Mark said, "Besides crops, Highway 34 carries a lot of traffic, Twomeys can not fill their barges, barges keep churning on the river using gas just to keep in one place due to the shift current. You just can't tie them up any place and expect them to stay with all that is going on. Mark said that the most moving thing to him is the people. "I want to thank everyone who came to help. Twomey' Co., especially did more than anyone could ever ask of them. "The Kim Gullberg family were great, and hundreds of volunteers from all corners of the county. You can't imagine how much it meant to us. "And especially Marty Lafary, Chairman of the County Board. He was in charge of the operation of all this and he has done an excellent job. He supplied whatever we have asked and I know they are meeting daily to take care of cleanup. It's not over yet!" "Many of these people who are helping have lost homes, farmland, or vehicles. In the middle of all of this moving machinery, grain, etc., folks came out to help other folks out. "My sister came from Arkansas to help in my family. "My son went through sunburn, exhaustion, my daughter had calloused hands and aching muscles. It's overwhelming when I think about it. :to think how everyone had to figure out their personal problems, yet they came to help out. "I get emotional thinking what everyone did for us. Without the help of so many many people, at the levee and and with moving stuff at night, we couldn't have done it. Now, it is what might seem like "little things" that overwhelms Mark. "I went to a flood meeting and came home yesterday afternoon and my yard was all mowed and my son's yard was all mowed as well. "Bundys just came over and did it. That's the good neighbors we have. Things like that make you feel so good inside about living here. There's not a better place on earth to live than here. Most of the people that are suffering from water logged homes, farms, equipment: most say they are not going to stay in the flood region of Henderson County:but they feel, like Mark, "There is no better place to live than in the outstanding county of caring people," :they're just moving to higher ground." Right now, the best thing is to stay out of water down there. There is the issue of field tanks that didn't get pumped out and things floating around down there ... it is not a safe place to be," Mark said. "There is a curfew... and you have to log in when you go in and log out when you leave." "If you have a good reason that you must go in there, the Sheriff may, at his discretion, issue you a permit. They do not want sight seers - it is too dangerous. The Sheriff is the only one with authority to issue the passes. It's all for safety, the Emergency Management Team says "LETS BE SAFE"-- that's their biggest concern that people come through it alive and healthy." "Property damage is insignificant to a person's life." Those who live in the Drainage District pay an extra $20 tax per acre to maintain the Districts, levees and pumping station. Mark & his wife Olive live at the Carman-Stronghurst road on higher dry ground, but their farm, and the farm home of his parents, the Earl Fords, is in the flooded area of District #2. The Carthage Lake Club House, located on the river side of the levee, is high and dry as it was raised and rebuilt after an earlier flood, and then after a fire. The warning came of the higher crest waters on Wednesday, June 11, predicting a 25.8 crest at Burlington, IA (flood stage is 15') due to waters coming from the Iowa River from Cedar Rapids and from Iowa City that were pouring into the Mississippi River. The levee break at Carthage Lake was 3/4s of a mile south of the Pumping station, almost directly across from Mark's parents home, the Earl Fords. River stage was 25.7 6/17/08 at 4 a.m. breaking the record of 25.1 on 7/10/1993. It dropped to 25.46 at 5 a.m.
Drainage District #2 Commissioner Mark Ford, keeps constant communication by cell as they finish up work on the levee, prior to a breach last Tuesday, June 17th..